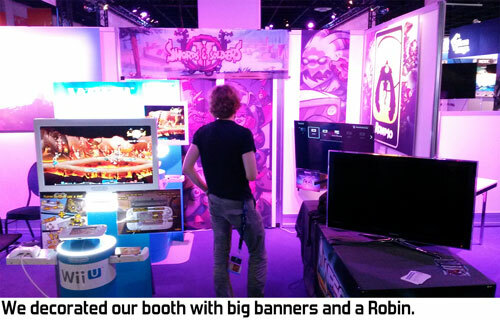 Last week we were at Gamescom, showing Swords & Soldiers II and Awesomenauts to the public. Gamescom is the biggest game convention in the world, drawing in a whopping 400,000 people. 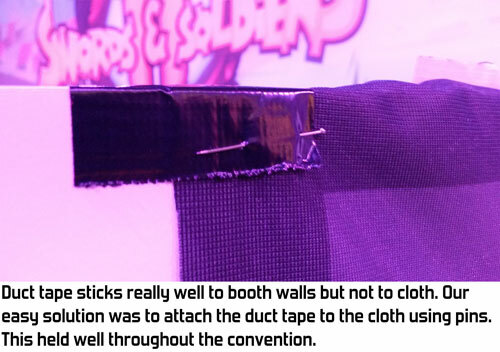 We have had booths at several conventions in the past years so I figured it might be interesting to share some tips and tricks based on our experiences. Our booth at Gamescom was part of the Indie Megabooth. The Indie Megabooth is an awesome initiative where a lot of indies hire a big area together and fill it with their games. Since the Indie Megabooth has been so successful in recent years it is now a real organisation with dedicated people to manage it all. There are several advantages to being part of the Indie Megabooth. For starters it is quite affordable and they take care of a lot of the organisational complexities. More importantly it gives gamers who like indie games a clear spot to go to, hopefully making indie thrive more on a big convention where most booths are gigantonormous monsters from the big publishers. 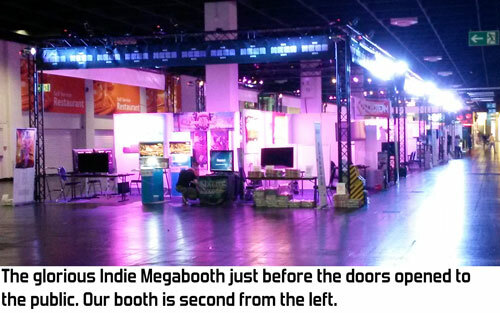 Another good reason to join the Indie Megabooth is that it is great to meet other indies and hang out with them. For example, we were next to Capybara Games, creators of Below, Super Time Force and Sword & Sworcery. Since I really look up to them it was inspirational for me to meet them and discuss game development. As with all good things there are also some downsides to the Indie Megabooth, in this case mostly because it is so good. The Indie Megabooth is very popular among developers so they get way more requests for booth spots than they can handle. The result is that not everyone can get a booth. It also makes them not very flexible if you want a bigger booth. To decorate our booth we used big cloth banners. This works really well: they weigh little and unlike posters they hardly tear or damage. You can just roll them up and bring them along. Banners are also a really cheap solution: the type we use costs only around €20 per banner (we got them at Drukwerkdeal.nl). The only downside to the banners we use is that they are slightly transparent, so if the surface behind the banner is coloured or uneven then you might see this through the banners. The most important thing to us is that as many people as possible get to actually play our games. 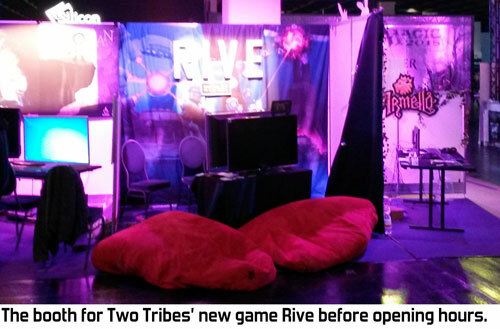 For this reason we put four screens in our booth: two for Swords & Soldiers 2 and two for Awesomenauts. 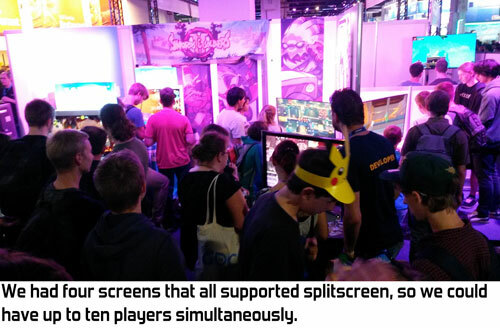 Since both games support local multiplayer we could have up to ten people playing in our booth. This is quite a lot more than any of the other indie booths, where some could have only one player at a time since they brought just one computer for a single player game. Since players could also play single player on our screens we had between four and ten players at any given time. We rarely had unused computers for longer than a couple of minutes. If audio is important to your game then be sure to bring along some big headphones. 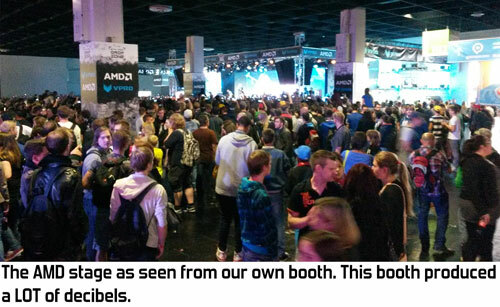 There is a lot of noise on game conventions, especially from big booths. We were near an AMD stage where people received free stuff if the crowd shouted "AMD" loudly. At other moments they just played really loud dance music. The Indie Megabooth crew even gave all the indie exhibitors earplugs because of this. One of the other exhibitors had even brought along a microphone to talk to his players without having to shout. When I talked to him it felt quite awkward that he answered me through a microphone while I was right in front of him so I wouldn't personally use this method. Still, I totally understand why he solved the sore-throat-from-talking-loudly-all-day problem this way. The goal of going to a convention is of course marketing and business. We had a lot of good business meetings and we had many players at our booth, but unfortunately we didn't reach as much press this time as we had hoped. We asked around and most indie devs said the same thing: it was difficult to get a ton of meetings with press going this year. This might be because Gamescom doesn't show as much new stuff as E3, so it is a bit less interesting to the press. A couple of developers did have a lot of press meetings. One had hired a PR agency to set up the press meetings. While our experiences with PR agencies have so far been very bad, this one had apparently done really well and set up a lot of interviews for them. Another dev said they had started to contact press four weeks in advance. We only started contacting press two weeks before the convention, so we might have also been too late for maximum reach. In general though most devs said they didn't meet as much press as they had hoped, so it seems like Gamescom might also just not be the best spot for this. Of all the conventions we have visited so far we had the most success at Eurogamer Expo a couple of years ago. I have no idea whether that was accidental or whether Eurogamer is actually better for reaching out to press. From press we go to another exciting topic... utensils! It is a really good idea to bring along a bag of random utensils. My colleague Robin had brought along things like scissors, pins, several types of tape, screwdrivers and pens. Several of our neighbours borrowed them during the convention, so apparently not everyone brings such things along. You never know what might be wrong with your booth so it is good to pack these even if you don't expect to actually need them. Convention visitors love button badges. 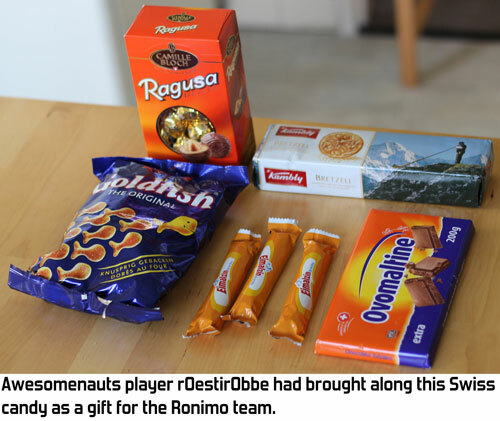 They often stick them to their bag right away, hopefully triggering a tiny bit of extra word of mouth and definitely making sure the player remembers the game when he gets home. Buttons are really cheap to order in large batches so we just doled them out freely. To my surprise our flyers were quite popular. I even saw quite a lot of visitors grab a flyer without playing the actual game. If you are making a console game then be sure to ask the platform holder for permission to bring along testkits, or borrow special exhibition kits from them for your booth. 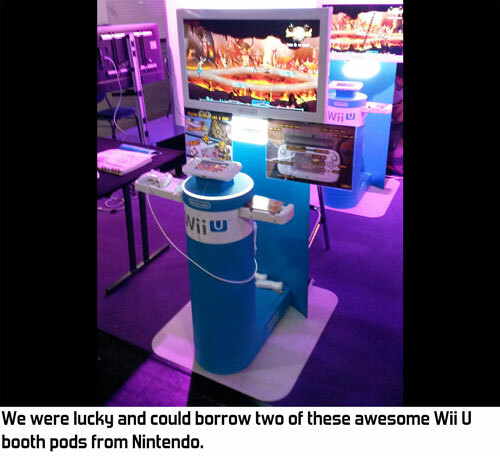 Travelling with devkits is generally not allowed and you definitely don't want the risk of having to explain to Nintendo, Microsoft or Sony that a devkit was stolen from your luggage... We even got lucky and received two of these awesome exhibition stands from Nintendo. They look really professional and take up less space than a table with a television, so this was really cool. Really important when exhibiting at a big convention is to never let your booth remain unattended. Always have someone there to look after your stuff. Theft happens a lot at these conventions. The worst time for this is during the night. We knew this beforehand so we brought small computers and carried them to the hotel every evening to be sure they were never left unattended at the booth. Several other indie devs apparently were not aware of this, resulting in two console testkits being stolen from the booths during the night. Never leave stealable stuff at your booth when you are not there, and don't trust convention security to keep your booth safe.